The Backup Repository step of the wizard is available if at the Destination step you have chosen to save backup files on a Veeam Backup & Replication repository. In the Specify backup repository name field, type the name of a backup repository where you want to store created backups. To store backups, you can use a simple backup repository or a scale-out backup repository. Select the Specify user credentials to access the selected Veeam Backup & Replication server and its backup repository check box. In the Username and Password fields, specify a user name and password of the account that has access to this backup repository. Permissions on the backup repository managed by the target Veeam backup server must be granted beforehand. For details, see Setting Up User Permissions on Backup Repositories. If you do not select the Specify user credentials to access the selected Veeam Backup & Replication server and its backup repository check box, Veeam Agent for Microsoft Windows will connect to the backup repository using the NT AUTHORITY\SYSTEM account of the computer where the product is installed. You can use this scenario if the computer is joined to the Active Directory domain. In this case, you can simply add the computer account (DOMAIN\COMPUTERNAME$) to an Active Directory group and grant access rights on the backup repository to this group. Setting access permissions on the backup repository to Everyone is equal to granting access rights to the Everyone Microsoft Windows group (Anonymous users are excluded). If you have set such permissions on the backup repository, you can omit specifying credentials. However, this scenario is recommended for demo environments only. [For Workstation operation mode] In the Keep backups for the past <N> days when computer was running field, specify the number of days for which you want to store backup files in the target location. By default, Veeam backup agent keeps backup files for 14 days. After this period is over, Veeam backup agent will remove the earliest restore points from the backup chain. For details, see Backup Retention Policy in Free and Workstation Editions. [For Server operation mode] In the Restore points to keep on disk field, specify the number of restore points you want to keep in the target location. By default, Veeam backup agent keeps 14 latest restore points. After this number is exceeded, Veeam backup agent will remove the earliest restore points from the backup chain. 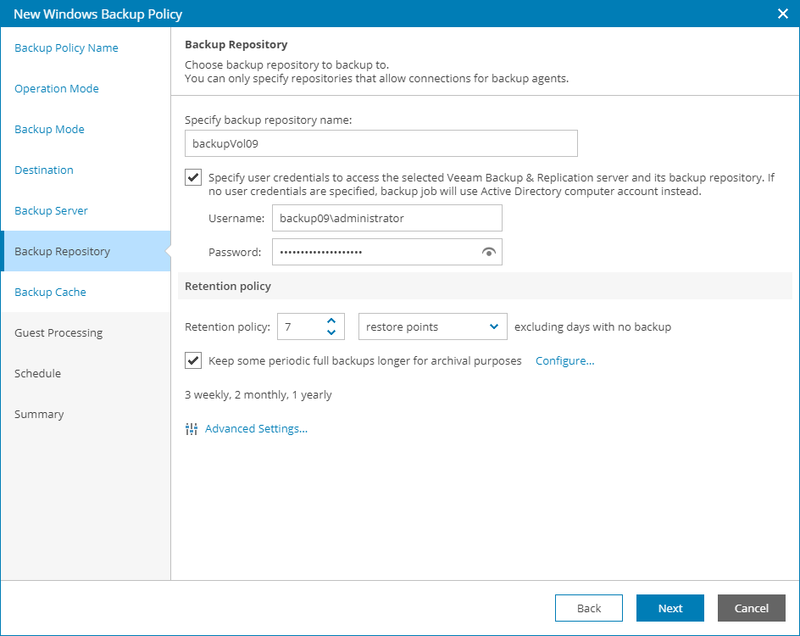 For details, see Backup Retention Policy in Server Edition. Click Advanced Settings to specify advanced settings for the backup job. For details, see Specify Advanced Job Settings.